There are a lot of tools in Tabletop Simulator to help make your gameplay sessions manageable and easy to run. As such, there are different player roles in place to make your life easier. The host is the admin of his/her server and is in full control. He/she can promote trusted players to help run the room. A gold crown is placed next to the host’s name. When you’re the host, all buttons on the top menu will be available. Click on OPTIONS. You will get a drop down showing Options, Grid, Hands and Turns. Options is the one where you set the different permissions for the rest of your users. Full options and permissions that the host can set can be found here. The host can promote trusted players to give them most of the power that the host has. To promote a player, just click on the player’s name on the top right and choose the “Promote” option. Once the player is promoted, they have a shield next to their name to show the promotion. Hosts can mute, kick and ban disruptive players, change players’ seats, teams and many other things. – They cannot do anything associated with the names menu on the top right other than change their own color and team, or mute a player. – They cannot control/change any scripting. – They cannot import any custom content, although they can import saved custom objects and Workshop items. – They cannot modify custom objects. – They do not have access to the Points tool. – Players can choose a seat when they join a server if the host allows the option. Once seated, the player has access to various parts of the game depending on what permissions the host has available. – Players can leave their seat and become a spectator (grey) at any time. – Players can change their color and team by clicking their name on the top right. 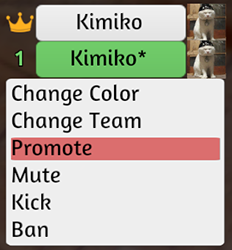 – Players can mute another player by clicking on a name on the top right. This is only for their own personal use. – Game Master is the “Black” color. – Game Masters have the all-seeing eye. They can see all information that is hidden to other players. Game Masters can see everything in Hidden Zones, Card Hands and all pages in the Notebook. – Game Masters do not have any host controls, so the host will need to enable certain features if the GM is supposed to use them or just promote the GM. – Only the host can choose a Game Master. – To become a spectator when you join a room, you need to click the grey color. As a spectator, you can do just that – spectate. You cannot interact or manipulate anything in the room. If you try, a message will show up in chat letting you know. You can control your camera and chat in both the game and global chat as well as view rules of the game in the Notebook. – If the option is available, spectators can change their color at any time to an open seat around the table. Hosts can also become spectators, but they still have full control of their server. You can have as many spectators as you’d like in a room up to the max number of players allowed.